The whole place was lovely. Nice owner Bill. Lovely apartment. Beautiful gardens and pool. Great location out of town but only 10 mins walk. Super. Calderimi is very nice place to stay for vacation, i recommend it. Quiet place, very clean, very comfortable, we had everything we need. Owners are very friendly and helpful. If i come in Lefkada again, i would stay in Calderimi again. Great location, great appartment. Very well kept. Nice pool and good vibe. Very friendly owner. Would definitely reccommend staying here! Best place to stay when you're in Lefkada. The owners and their family are very friendly, warm and welcoming! They always wanted to help you with everything. Nothing was too much. I can recommend this place to everybody! I would like to start by thanking the owner. He tried to make our stay as enjoyable as possible and whatever request/question we had he constantly tried to provide answers and solutions. He even changed our room as soon as I reported a small issue which for an ''un-pregnant'' person wouldn't cause any discomfort at all. The location is great, only 7-8 minutes walk to Nydri's Harbor. Parking place is spacious and safe. If you are looking for a relaxing and quiet place you have found the right spot. Beds are quite comfortable and you will be far away from noise and traffic. Pool is cleaned every day, bed sheets and towels are replaced every 3rd day if I remember correctly however, upon request we always received fresh towels.. Dimitri's Taverna near by is a must try place. Great value for money! The host was very helpful - he gave us tips about where to eat local dishes at good prices, he told us about the beaches around the island. The room was very spacious and clean , and aslo quiet thanks to the emplacement ( surrounded by olive trees and mountains ) . wonderful hosts! quiet and peace! cleaning in the room and in the yard and at the swimming pool too~ and.. people staying there of great quality!!! Thanks a lot Bill/GOOD JOB! Mihaela from Romania, Sibiu Thanks a lot people~!success and improvement at work! A secluded, clean and comfortable place. Good sized room with balcony. The pool was really lovely without of loungers. 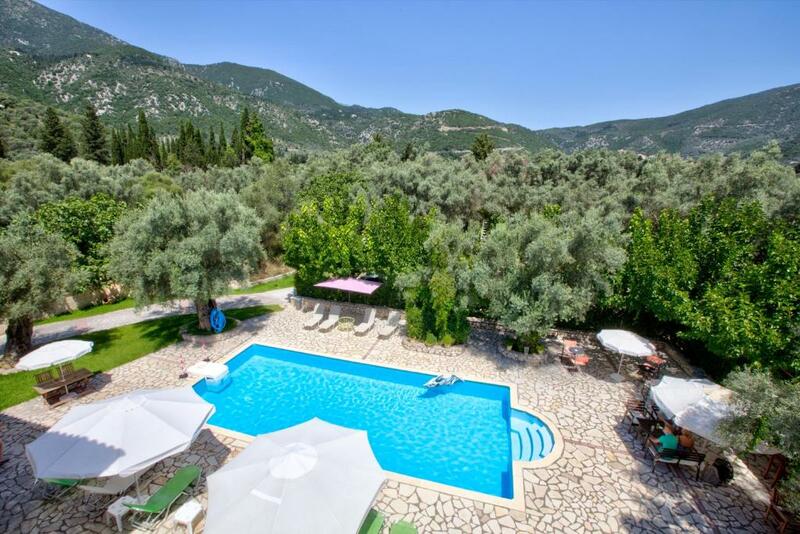 Lock in a great price for Calderimi Lefkada - rated 9.3 by recent guests. Surrounded by olive groves, Calderimi Pension is conveniently located 900 yards from the centre of Nydri Town. It features an outdoor swimming pool, sun terrace with sun beds and free WiFi internet access. Each studio at Calderimi is air conditioned and includes a mounted flat-screen TV. The kitchenette has a fridge and small oven with cooking hobs for the preparation of light meals. Guests will enjoy views of the pool, mountain or garden from their balcony. Calderimi Pension provides private parking on site. The bustling town of Lefkada is at a distance of 17 km, while Aktion National Airport is 23 miles away. This property is also rated for the best value in Nydri! Guests are getting more for their money when compared to other properties in this city. Calderimi Lefkada has been welcoming Booking.com guests since 14 Mar 2013. When would you like to stay at Calderimi Lefkada? Providing mountain and pool views from its balcony, this air-conditioned studio is located at the ground floor. It offers a flat-screen TV and a kitchenette with fridge and mini oven with cooking hobs. Free toiletries and a hairdryer are included. Providing mountain and pool views from its balcony, this air-conditioned apartment offers a kitchenette with a fridge and small oven with cooking hobs. A mounted flat-screen TV and bathroom with free toiletries and a hairdryer are standard. This studio has a balcony, kitchenware and soundproofing, and is located on an upper floor. Calderimi pension is an ideal oprtion for your summer holidays, if what you are seeking for is a peacefull environment in a convenient location for your excursions to the magnificent beaches of Leykas island. Our family is running Caldetimi pension and our main motivation is to provide you hospitality and make your holidays a special experience. Our pension is located 800 meters from the center of Nydri town, in a quiet road surrounded by olive trees. House rules Calderimi Lefkada takes special requests - add in the next step! Free! One child from 12 to 18 years stays free of charge in an extra bed. Calderimi Lefkada accepts these cards and reserves the right to temporarily hold an amount prior to arrival. Please inform Calderimi Lefkada in advance of your expected arrival time. You can use the Special Requests box when booking, or contact the property directly with the contact details provided in your confirmation. Would have liked a kettle instead of having a big pan to boil water for tea and coffee. Room safes need to be screwed down as they are could easily be picked up and taken away by a thief. I hate giving bad ratings, but the WiFi (in our apartment anyway) was non-existent. The furniture was ok but it could be renewed. If you're coming back to apartments by night, the road that leads to house is not lightened almost at all. Very nice looking house and property; our room was spacious and had two-way out of it - you could easily access the pool and backyard. This house is less than 10 minutes walk from Nydri center. Has parking in its backyard. Ok value for money. Towels were provided. Although you can see that the accommodation hasn't been recently renovated, everything is kept as clean and as tidy as possible therefore, I wouldn't classify this as a minus. The road leading up to the pension is unlit and there is a bit of wilderness around, but nothing to worry about. The location is very good(away enough from the town so that it is quiet, but close enough so that you can walk into town easily). The owner is very nice and friendly and helped us decide which beaches and restaurants to visit, the pool is clean and quiet. Very very good! the weather .. never in Greece, cold, rain and cold water... Aegean Sea for 8 years is more pro-warm, hotter and better with children!But this has nothing to do with the hosts ... they are wonderful! Great location, superkind and friendly hosts who were always ready to help! Superclean and beautiful place about 10 min walk from Nidri ! We had the greatest 5 days in Calderimi with my family. We love small and unique hotels and this was one of the best. Lovely Tavern Dimitris with good food near by. The only think that could have made our stay better would be for less noise at night. There was a dog barking and a car racing down the path.